A Satinsky clamp is placed obliquely across a 5-cm segment of the anteromedial wall of the IVC in a direction parallel to the course of the overlying portal vein and the IVC is elevated toward the portal vein (A-1). A 5-cm segment of the portal vein is isolated between two angled vascular clamps and the portal vein is depressed toward the IVC, bringing the two vessels into apposition. 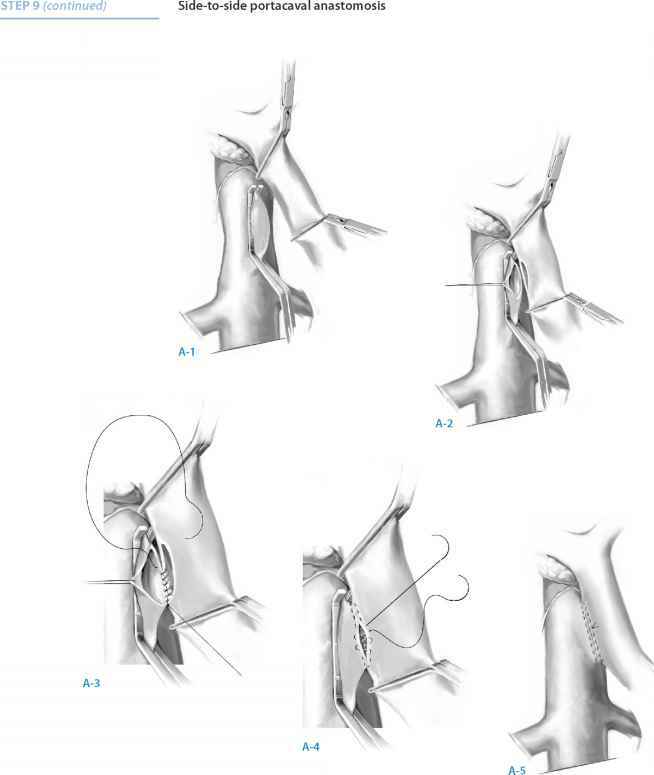 A 2.0- to 2.5-cm-long strip of the IVC and a 2.0- to 2.5-cm-long strip of the portal vein are excised with scissors (A-2). It is important to excise a longitudinal segment of the wall of each vessel rather than simply to make an incision in each vessel. 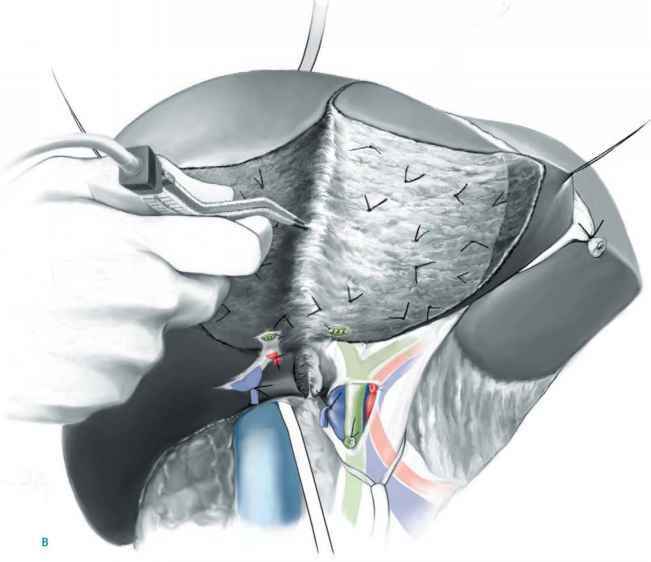 A retraction suture of 5-0 silk is placed in the lateral wall of the IVC opening and is weighted by attachment to a hemostat to keep the IVC orifice open. The clamps on the portal vein are momentarily released to flush out any clots and then the openings in both vessels are irrigated with saline. The anastomosis is started with a posterior continuous over-and-over suture of 5-0 vascular suture material (A-3). The posterior continuous suture is tied at each end of the anastomosis. The anterior row of sutures consists of an everting continuous horizontal mattress stitch of 5-0 vascular suture material started at each end of the anastomosis (A-4). The suture started at the inferior end of the anastomosis is discontinued after three or four throws and is deliberately left loose so that the interior surface of the vessels can be visualized as the anastomosis is completed. In this way inadvertent inclusion of the posterior wall in the anterior row of sutures is avoided. The suture started at the superior end of the anastomosis is inserted with continuous tension until the inferior suture, at which point the inferior suture is drawn tight and the two sutures are tied to each other. Before drawing the inferior suture tight, the clamps on the portal vein are momentarily released to flush out any clots, and the anastomosis is thoroughly irrigated with saline (A-5). Upon completion of the anastomosis, a single interrupted tension suture is placed just beyond each end of the anastomosis to take tension off the anastomotic suture line. The clamp on the IVC is removed first, the clamp on the hepatic side of the portal vein is removed next, and finally the clamp on the intestinal side of the portal vein is removed. Bleeding from the anastomosis infrequently occurs; it can be controlled by one or two well placed interrupted sutures of 5-0 vascular suture material. Pressures in the portal vein and IVC must be measured after the anastomosis is completed. Usually the postshunt pressures in the portal vein and IVC are identical. A pressure gradient of >50mm saline between the two vessels indicates an obstruction in the anastomosis, even when no obstruction can be palpated. In such circumstances, the anastomosis should be opened to remove any clots and, if necessary, the entire anastomosis should be taken down and redone. It is essential that there be no more than a 50mm saline gradient between the portal vein and IVC to achieve permanently adequate portal decompression and to avoid ultimate thrombosis of the shunt.